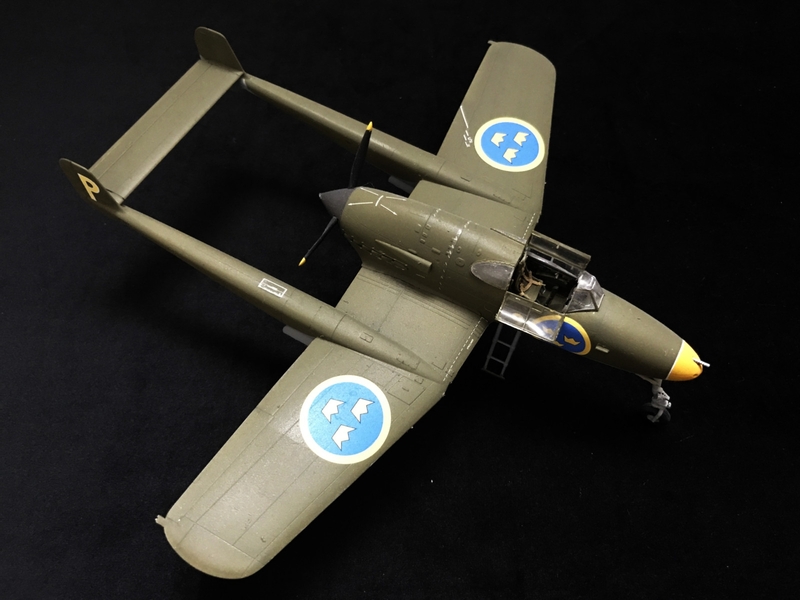 Saab J 21A was an odd fighter developed by Saab in Sweden during WWII. 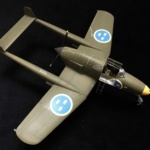 It first flew in 1943 and the first serial production planes were delivered in early 1945. The propeller behind the cockpit forced Saab to develop the first powder propelled ejection seat ever used in a serial produced aircraft (they didn’t patent the invention which the English producer Martin Baker did ending in a long legal fight). After WWII jet engines became available and Saab decided to try and convert the J 21 to jet. It first flew in 1947 and was put into serial production as J 21R. 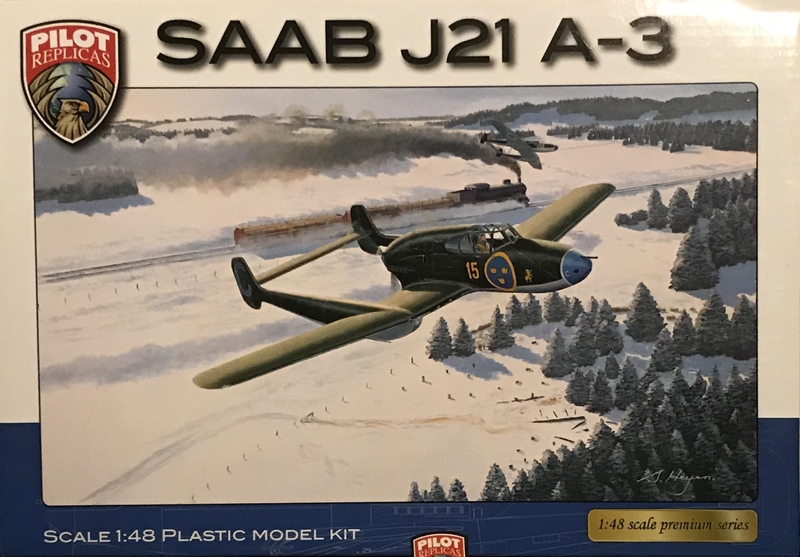 Thus the Saab J 21 became one of the only two propeller aircraft to be converted to jet. The other was the Russian Yak-3 that was converted to the jet propelled Yak-15. 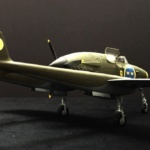 The Pilot Replicas kit is the only one in scale 1:48. Unfortunately it is currently unavailable except if you find one on Ebay. Let's hope it will soon return because as you will see this is a very good kit. 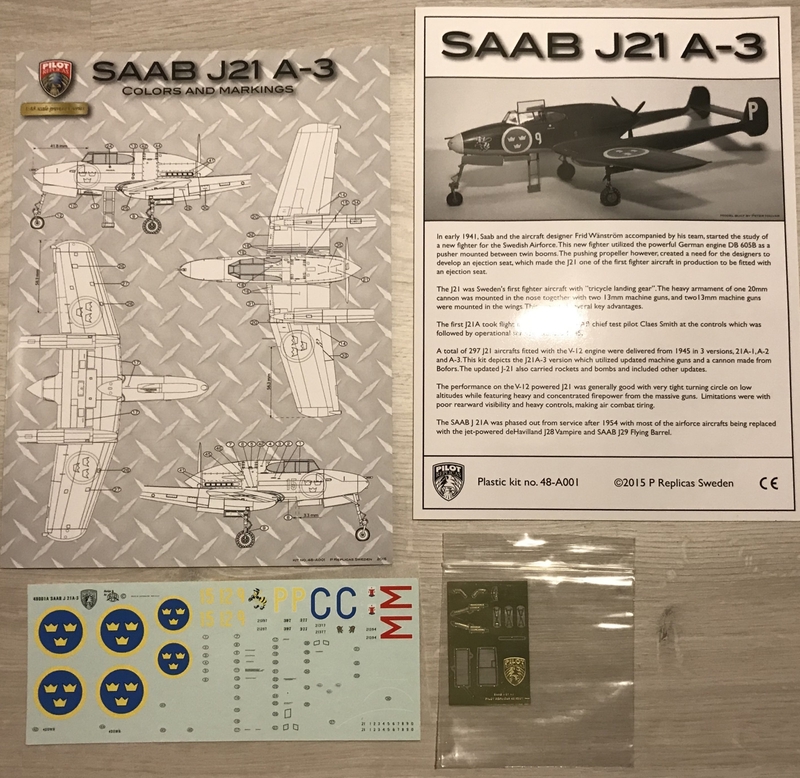 The box contains the plastic parts, decals for three individuals, etched metal (PE) details for the cockpit and two well printed sheets, one with the building instructions and one colour print with colour and decal instructions. Now, before I begin I'll start with apologizing for the lack of in build pictures. This review is written after I've built the kit. The box content pictures above is from an unbuilt kit I just managed to pull off Ebay. 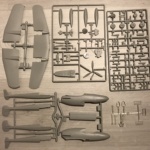 The cockpit is fairly detailed and made in five steps. The final one is the seat belts which are PE parts. Being spoiled by Eduards prepainted etched parts I'm a bit annoyed by having to paint these as it's hard to get the paint do sit tight. Always prime the parts before applying the final paint. The instructions clearly indicate the colours that should be used on each part which is not always the case in all kits. 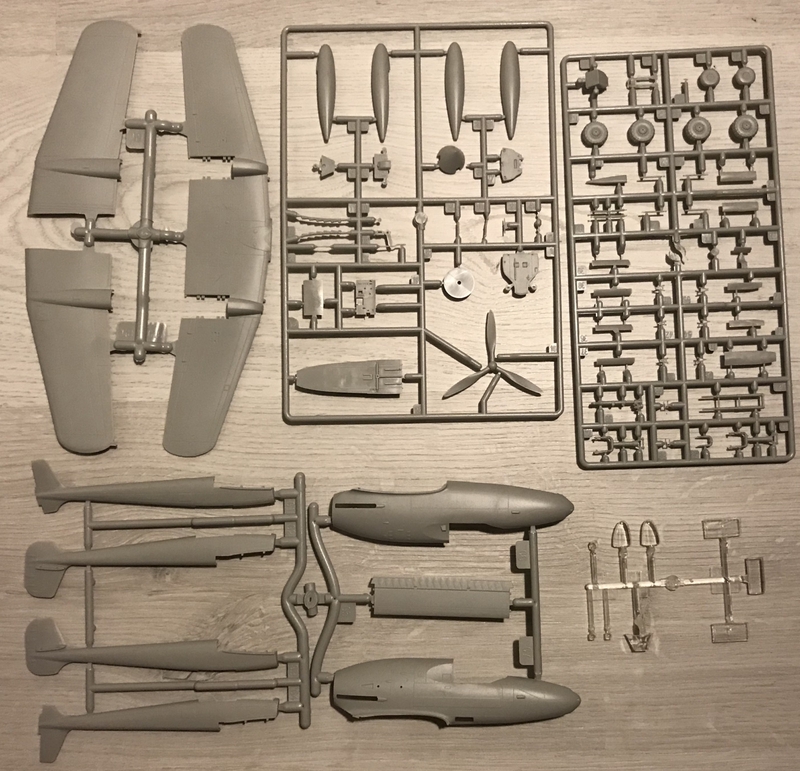 A draw back in this kit is that the landing gears must be fitted before the kit is ready to paint which makes the paint work a bit more complicated. On the other hand they are good on details with some optional PE parts. I suggest that you wait with the smaller parts of the landing gears until after painting though to minimize the risk of damage. 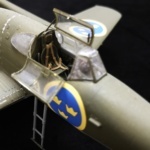 The planes structure, the fuselage, the wings and the twin booms are excellent in detailing. The panel lines are just enough in my book, visible but not intrusive. The parts fits very well and the need for filling and sanding is minimal. Take your time when assembling the twin booms though and let the glue harden before continuing as you want them to stay in place. And do not forget to add a weight in the fuselage nose! Otherwise you'll get a tail seater. Doing the cockpit canopy can be a bit fiddly if you want to use the PE parts. To glue them into place without damaging the clear parts takes precision and patience. But the result is worth it. Be sure to paint them before fixing them though. The instructions only indicate them in an open position and so I did. I do believe that placing them in a closed position could be an even larger challenge. 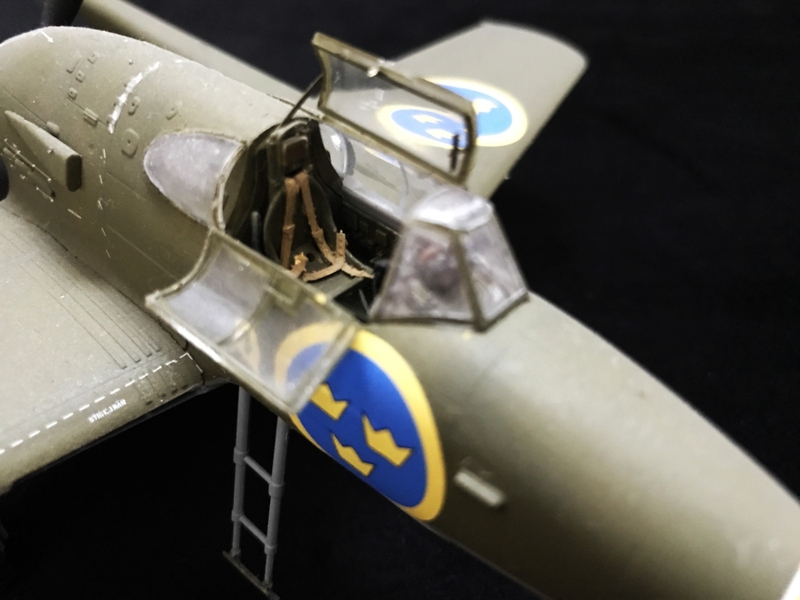 As a final touch you have the option to place the cockpit ladder in a extended position. 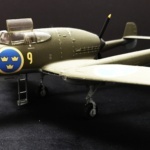 The decals are for three different individuals based at three different wings around Sweden. 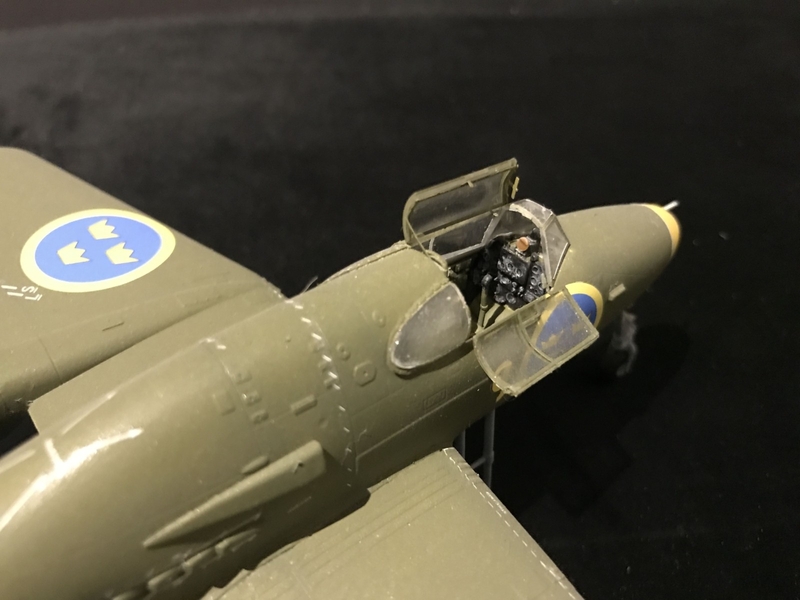 The last one is "Gul Petter" (Yellow Peter) which feature a boxing hornet at the left side of the fuselage and this is the one I made. The decals adhere nicely and also adds fine details. 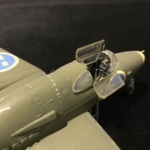 Be sure to prepare the kit with gloss varnish before you apply your decals as some of them has clear parts that easily becomes milky if set on a matte surface. When the decals are settled you finish off with a few layers of matte varnish. Do you need reference pictures when you build your's? You'll find some here. This is an excellent kit, no mistake. This is also fortunate as this is the only one available in scale 1:48. The fit is very great and the details are fine for this scale. If you find one out there get it! The fit and the detailing. The general feeling of a luxury production. 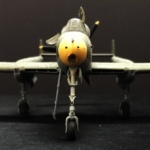 The fact that you have to fix the landing gear struts before painting.